So – what’s up now? Well, you all saw the previous post about the LED list? That’s actually what happens right now. We are about to add the list in the bedroom. 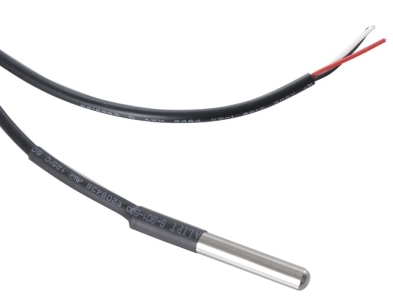 At first I only thought that the RGBW module from Fibaro should be used to control the LED, but as of today I bought two DS18B20 temperature sensors that I will try to connect to the module and have the values sent to openHAB. Since the RGBW-controller is placed in the bedroom, these two sensors will be used for ”bedroom temperature” as well as ”outdoor temperature”. The later will be of most value of course. 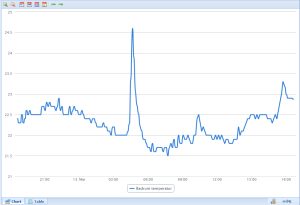 Thanks to the ”addon” HABmin it’s fairly easy to display graphs of how the sensors has been changed over time period X. 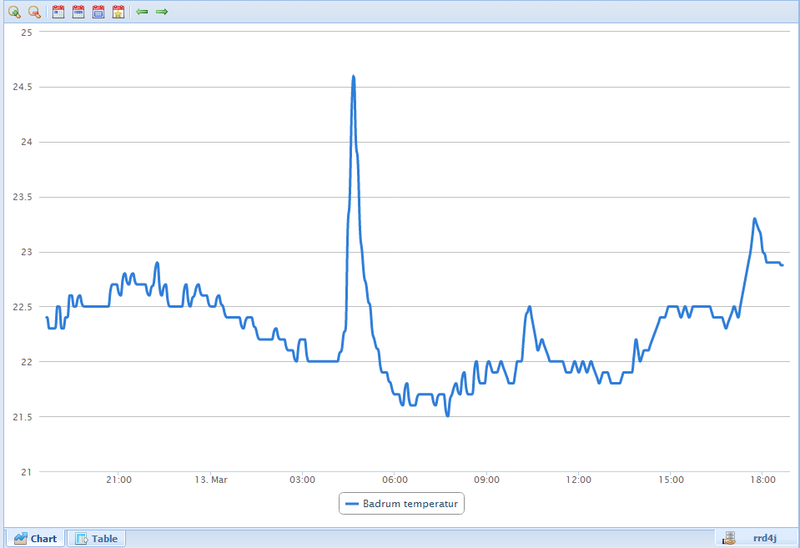 This is an image showing the temperature from the bathroom where a AEON 4in1 sensor is installed. Of course the values are accessible in openHAB. Anyone can figure out when showering took place this morning? Yep – right, I was up awfully early! Some other comments from the use of the system so far? Well, the alarm integration was absolutely worth the effort. Even though I have not developed the support to send commands over RS-232 to the PowerMax Complete module I still get all the events and statuses from the system into openHAB. That was actually another ”must have” or ”deal breaker” when decided to use openHAB instead of other more expensive ”not open sourced” systems. An alternative should of course be to add Z-wave nodes in parallell with all the alarm sensors, but what a waste! Time cron "0 * 0,23 * * ?" And as before, even though not mentioned in the post, all the state and commands are sent from openHAB on the MQTT bus in RabbitMQ – so actually available outside the OH as well. That i think is an important thing for further compatibility with other systems. Here it’s very obvious that I’m a beginner in the area. DS18B20 is a digital unit, and the RGBW from Fibaro (I found out) only supports analog sensors. How did you connect your Raspberry pi to your Visonic Powermax? Do you use the Visonic RS232 adapter kit, conversion to usb or connect to gpio pins on raspberry directly? I used the RS232 Adapter kit (bought by Protexus in Sweden) together with a RS232->USB adapter. I think it would be very possible to directly connect the pins to RPi’s GPIO, but didn’t spend any time here.